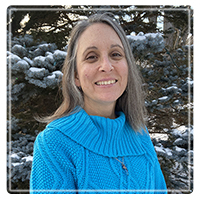 Peterborough Therapist: Myria Rei Solas - Therapist K9H 4R1. Send A Message To Myria. Talking to someone and being heard are aspects to being human. This is what I feel is the most important part of counselling. I believe we all have within us the ability to heal and grow and find answers to what we are looking for. I feel my job is to assist clients in accessing their inner abilities and strengths and supporting clients through their life journey. I love to make art, dance, and be outdoors. My background is in the healing arts. I still offer sessions in Reiki and other alternative modes of therapy on request. I worked in the community doing volunteer work with children, youth, and adults, as well as teaching parenting classes for over 20 years. I have a Masters in Counselling Psychology and Art Therapy. I am a counsellor, art and play therapist. I love my work and believe that everyone has the ability to heal within themselves. I provide a creative and open atmosphere that encourages clients to be themselves and allows what needs to become known to present itself in its own way because each client is unique. We may use art or poetry, or sand tray, or we may sit and talk. Every client is invited to take a therapeutic journey all their own, at their own pace to find what they need at this time in their life. I provide a gentle presence allowing the client to be heard and find the support they need. Making an interpersonal connection is so important to me. I hope to begin art therapy groups in retirement residences, or other local agencies in the near future. My specialties are in art and play therapy which I absolutely love! Anyone can participate in art and play therapy but I always fit the therapy with the person. You don't need to be young or experienced to do art or play therapy! What they do is engage your creative mind in finding new ways of solving problems, or soothing your soul, or shifting out of an old way of being, and that is good for anyone! Services can be sought for mental health issues, dealing with specific situations, or the desire to achive greater overall well-being. I work with individuals from age 2 and up. I currently have clients from the ages of 3 to 66, and various ages in between. When working with children and youth I provide ongoing parenting support and mentoring. I offer art therapy groups 3 times a year for adults. I run workshops several times a year as well. I occasionally offer workshops, healing arts groups for children, youth or adults, and parenting groups.